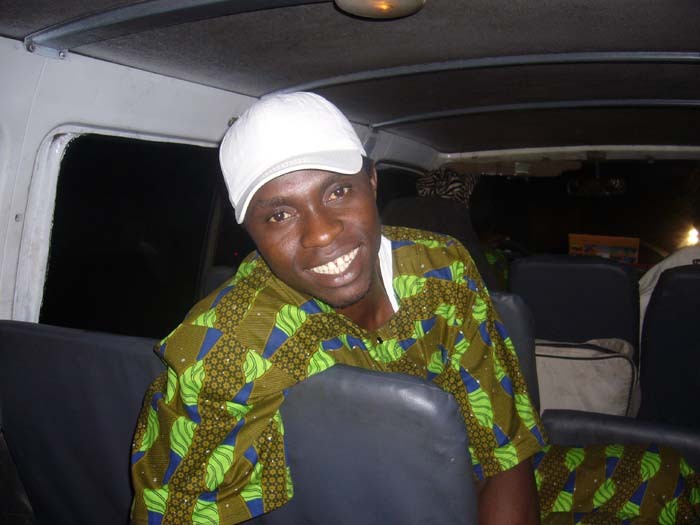 Visit the ‘smiling coast’ of West Africa for 1 month of music and culture with your host King Marong. Whether it’s the sophisticated music, the unique food, the array of traditional textiles or the historical significance of the region that interests you, this tour of a lifetime is sure to please. Open to all people who are passionate about African music and culture. A great opportunity to experience an intensive rich cultural exchange. 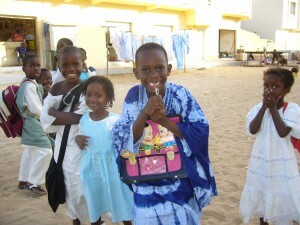 The Gambia, well known as the ‘smiling coast’, is a small country on the north west coast of Africa . 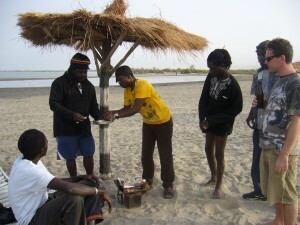 Situated on either side of the large and powerful Gambia River that dominates the country. Gambia is about 300 km long by an average of 40 km wide and is surrounded by Senegal. It has about 80 km of coastline on the Atlantic Ocean and it is also where the river meets the sea. 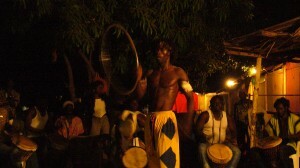 Gambia is vibrant, colourful and fascinating with many different tribes, traditions and a rich cultural heritage. 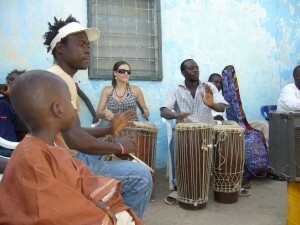 Gambia is a melting pot of cultures with communities from every country in West Africa keeping their culture alive through their music, this makes it possible to experience the customs and become familiar with music of several different cultural groups. This tour features several intensive day workshops with musicians, dancers and acrobats from 5 different tribes, all with different and unique performance styles and costumes. 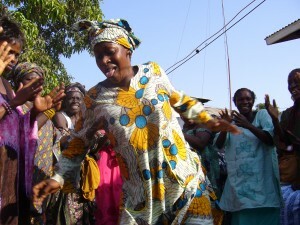 No matter what the tribal background, music and dance is an integral part of daily life in Gambia. Participants will have experiences that are unique as they witness what they are learning in its cultural context. As well as a focus on music there are many other activities suitable for singles and families alike. The local cuisine of the region is unique and delectable and it’s preparation a fine art to master, you too can learn how to cook with local women. 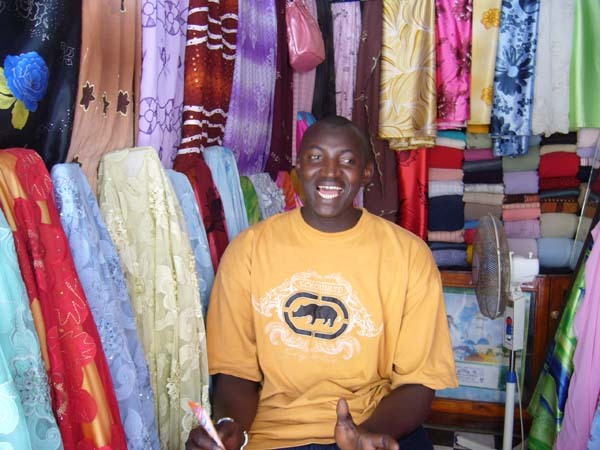 The bustling open markets are a cultural experience unto themselves and the range of local textiles impressive, for those artistic folk, there is endless inspiration. If you come from a health or education background, there is the opportunity to share your skills with the local schools and hospitals, a truly enriching experience for all involved. 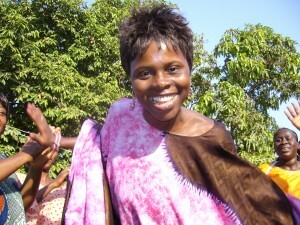 This tour supports socially responsible travel, whereby activities result in positive outcomes for the local community. The climate is subtropical with wet and dry seasons (dry from November to May). 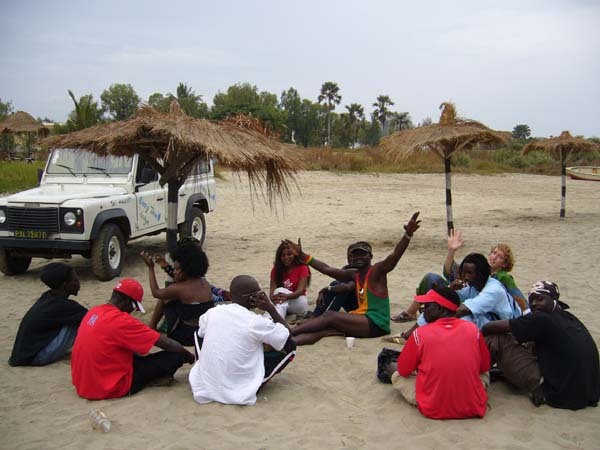 Average temperatures 25�-35� C.
Numerous tribal languages are spoken in Gambia but English is the official language, making it convenient to communicate and engage with the community. 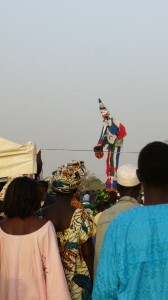 The courses will be held in the small coastal fishing village of Bakau . A beautiful area with many long sandy beaches, river estuaries, palm trees and baobab trees. Bakau is within easy walking distance to all amenities. You can choose between drumming and dance or you can do both. There will be a 2 hour session in the morning followed by a break then a 2 hour session in the afternoon from Monday to Friday. Other workshops available in conjunction with drum and dance are Kora (a 21 string gourd harp), Balafon (an African wooden xylophone) and Fulani Flute. 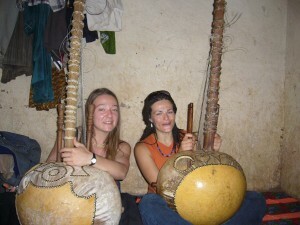 There is also the opportunity to take lessons in other local instruments including bolombata (gourd bass) and conting/ngoni (lute) at an extra cost. 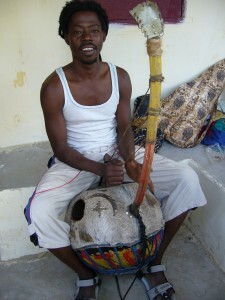 The ‘Language of the Drum’ with its different rhythms and techniques will be taught, using both hands and sticks on Djembe, Sabar, DounDounba and Boucarabou drums. The emphasis will be on learning different structures of rhythms, how to keep time using maracash, palm clappers and bells, the relationship between beat and offbeat and experiencing the feeling of rhythm in your entire body. There will be workshops to cater for beginners and also those advanced students who wish to refine their technique and take on more complex rhythms. Dance workshops will teach a number of local techniques, dances, steps and cultural styles, many of which culminate in a traditional ballet. Accommodation will be shared with two or three others in small houses, with toilet and shower, typical of the area. Gambia has an abundance of fresh tropical fruits and vegetables. 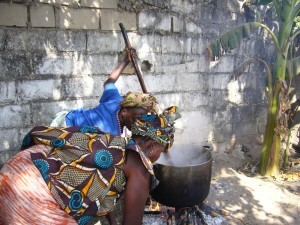 During the week 2 meals a day will be provided with lunch, the main meal of the day comprising delicious Gambian fish, meat and vegetarian dishes. A small kitchen will be available for tea & coffee or smaller meals. During the evenings the group will be visiting local nightspots and parties to experience the music in its cultural context, meals may be purchased at local restaurants for around $5 or less. On Saturday and Sunday you are free to explore Gambia on your own or with the group at organised events such as weddings or naming ceremonies. This can also be time to practise. Local transport is cheap easy and convenient to use. Travel costs covered when travelling as a group, travelling on one’s own certainly won’t break the bank! Annual JUNE TOUR – commences early June to coincide with semester break. 1 months accommodation, tuition, meals, ground transfers and special entertainment is $3500. 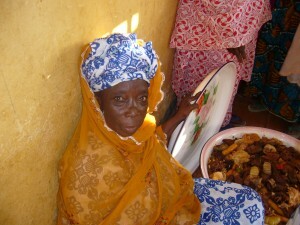 Flights to The Gambia should be arranged separately by travellers; assistance is available. A non-refundable $1,000 deposit is required at time of booking. Full payment one month prior to departure. All students are required to take out medical and travel insurance. Details provided with booking confirmation. 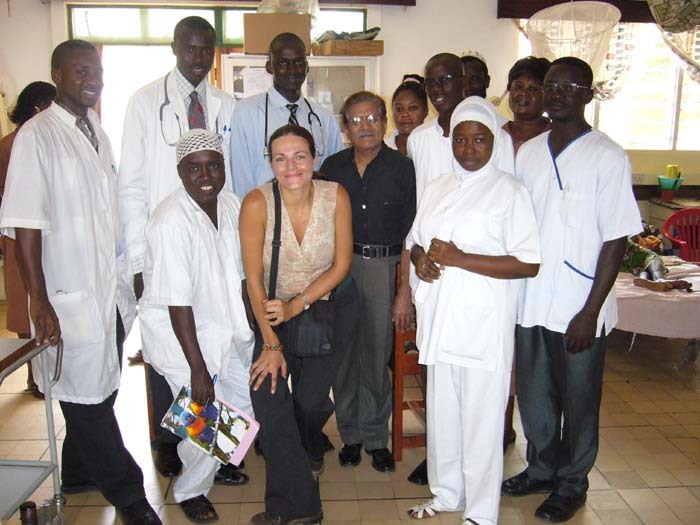 The Gambia ‘s only mandatory health requirement is a yellow fever vaccination. Anti-malaria medication is recommended. Visa: 1 month visa granted on entry to The Gambia, renewals as required. 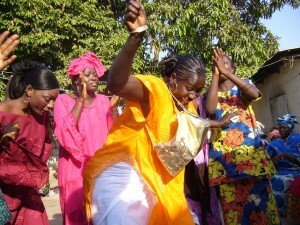 Gambia is a country rich in culture, the openness and generosity of the people will leave a lasting impression. Wow! Just saw you at womad in adelaide. definitely a weekend highlight for me. danced into a state of ecstacy. thankyou so much. and those joyful dancers. what a treat. myself and a few friends are looking into the january one month course. how are the numbers so far? is there still room? How many people do the course at one time? Thanks for your time.